In the excellent Native American film, Powwow Highway, we join Philbert Bono riding his “war pony” (A rusted, piece-of-crap Buick) as he leaves his home on the Northern Cheyenne reservation in Montana for a “vision quest” through a number of Plains states. 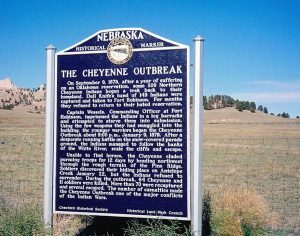 (See my post, “Native American Film Gems: Powwow Highway.”) Philbert stops at historical sites that are meaningful to the Cheyenne, including the former location of a military outpost, Fort Robinson, in Nebraska. Along with this gentle young man, we read the commemorative plaque and, like him, are horrified by what occurred there. This is an incident that cannot be forgiven, and should never be forgotten. Cheyenne chiefs Little Wolf and Dull Knife. In 1876 the Northern Cheyenne joined with the Lakota (Sioux) and Arapaho to defeat George Armstrong Custer and the 7th Cavalry Regiment of the U.S. Army at the Battle of the Little Bighorn (called the Battle of the Greasy Grass by the Plains Indians). Subsequent to this, the Army escalated its efforts to subdue the Plains tribes, and in 1877 Oglala Sioux war chief Crazy Horse surrendered at Fort Robinson. 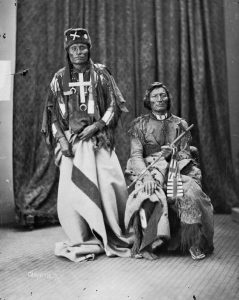 Cheyenne leaders Dull Knife and Little Wolf also brought their people in, hoping to be sent to the nearby Red Cloud Agency with the Lakota, in accordance with the 1868 Fort Laramie treaty, which both of the chiefs had signed. This reservation was closer to their tribal land in the Powder River region of the Wyoming and Montana Territories. But like so many other broken promises, the order from Washington sent the Cheyenne south rather than north—to a reservation at Fort Reno in Indian Territory (Oklahoma). They arrived there in the summer of 1877 to an unfamiliar, poverty-stricken land where food shipments and other necessities did not arrive, where they found no game to hunt (the skeletons of buffalo that once abounded there pocked the landscape), where measles and other white man’s diseases decimated their numbers. Even a federal investigation into the terrible conditions on the reservation proved useless. 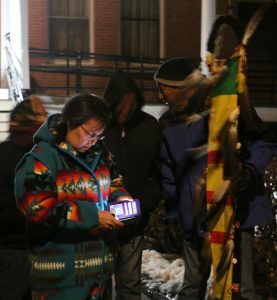 One year later, the Northern Cheyenne could not take any further abuse. Dull Knife, Little Wolf, and other chiefs advised their people to make ready to leave, and on September 10th, 1878 the Northern Cheyenne Exodus to their tribal land, a journey in excess of a thousand miles, had begun. Prisoners taken during the Northern Cheyenne Exodus. Approximately three hundred men, women, and children participated in the Northern Cheyenne Exodus, which would take them from Oklahoma into Kansas, then Nebraska, before reaching their goal of Wyoming and Montana. But along every mile of the trek they were pursued by U.S. Army troops, and a number of confrontations occurred as they fled. They hunted for food and upon occasion raided settlers’ homes and cattle ranches for supplies and horses. Later that fall, by the time the tribe had crossed the North Platte River into Nebraska, their numbers had decreased by about three dozen. Some had died or had been killed in confrontations; others had left to travel north on their own; a few had been taken prisoner. A decision was made to split into two groups. Those who still wanted to return to the Powder River country would go with Little Wolf. The others, about 150, were tired of running and would follow Dull Knife to the Red Cloud Agency, which had since been moved to Pine Ridge in the Dakota Territory, where they would join their Lakota cousins. The Red Cloud Agency, near Fort Robinson. Winter weather often comes early to the Plains states. On October 23rd a heavy snowstorm found the Cheyenne and U.S. Army troopers camped alongside one another, neither knowing the other was there until later because of the blinding snow. Both sides then stood down, and a council was held. 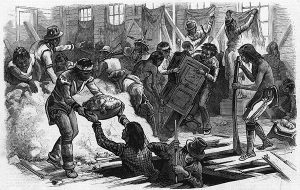 The soldiers gave the beleaguered tribe food and blankets, and they agreed to accompany the Cheyenne to the nearest outpost, Fort Robinson, to escape the weather. But only if the tribe surrendered its weapons. Dull Knife agreed to this, though not before they broke down the best of their guns and hid the pieces in the clothing of their women. 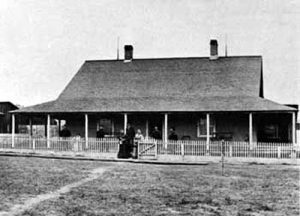 After arriving at Fort Robinson the Cheyenne occupied an empty barracks. The soldiers initially kept a close watch on them, but eventually they allowed their “guests” to move freely around the post. They could even leave the fort, as long as they got back before dark. Dull Knife made sure that his people complied with these orders. He felt certain they would be allowed to join the Lakota at Pine Ridge. Things went as well as could be expected for the first month. Then, in late November, the decision was made in Washington that the Northern Cheyenne must return to the reservation in Oklahoma, from where they had fled. At about the same time Dull Knife’s son left the fort to visit relatives and did not immediately return. As threatened, the Army confined the tribe to the barracks. An Indian agent told Dull Knife that his people would be allowed to leave if they returned to Indian Territory, but he refused the offer. His people would rather die, he said, than go south to Fort Reno. In December a new officer, Captain Henry Wessells, took command of Fort Robinson. He initially got along well with Dull Knife, and later that month he brought Lakota chief Red Cloud to the fort to meet with the Cheyenne leaders. Dull Knife reiterated that his people would not offer any resistance if the White Father in Washington would let him join Red Cloud on the Pine Ridge Reservation. 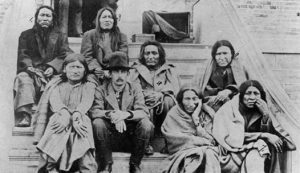 But on January 3rd, 1879 the final word arrived from the nation’s capital: the Northern Cheyenne were given no other option but to return to the reservation in Oklahoma. During the ensuing week, Dull Knife continued to refuse all demands to lead his people south. Wessells ordered bars to be placed on the windows of the barracks. Their rations were cut off, as was the wood they needed for warmth. The Cheyenne prepare to break out of their prison. 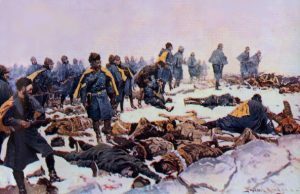 Finally, late at night on January 9th, the suffering band of Cheyenne reassembled their weapons, broke down the barracks doors and escaped into the night. The soldiers, many of them roused from their sleep, immediately took up the pursuit. In the one-sided battle that followed, approximately forty Cheyenne men, women, and children were killed. Over sixty Indians, a third of them wounded, were returned to Fort Robinson. A few more were captured over the next couple of days. The troopers, led in the field by Captain Wessells, were relentless. They pursued the remaining thirty or so Cheyenne for nearly two weeks, finally cornering them amid some bluffs northwest of Fort Robinson. The Indians made their last stand in a dry creek bed, called The Pit, and vainly fought off four companies of soldiers, about 150 men. The soldiers charged from three different directions, killing all of the braves, and some of the women and children. Survivors, eight in all, were found beneath the mounds of dead bodies. The battle at The Pit. The final tally: over sixty Northern Cheyenne dead, about two dozen wounded, nearly eighty recaptured. The Army reported eleven soldiers and one Indian scout killed, nine wounded, including Captain Wessells during the battle of The Pit. Ten of the Cheyenne, led by Dull Knife, managed to escape and headed for the reservation at Pine Ridge. In the aftermath, the U.S. Army sent some officers to investigate the massacre at Fort Robinson. Wessells was replaced as the commander of the outpost. Despite the officers learning the facts, the Cheyenne prisoners at the fort remained in custody for months. Word finally came from Washington to allow all of the Northern Cheyenne, including Dull Knife and his band at Pine Ridge, to go to Fort Keogh in Montana and join Little Wolf and his people on a nearby reservation—all that Dull Knife wanted in the first place. The Northern Cheyenne return to the site of Fort Robinson each year to remember the fallen. In 1994 the Northern Cheyenne would reclaim the remains of their ancestors that were slaughtered and buried around Fort Robinson in Nebraska. Those who died so long ago were reinterred on the Northern Cheyenne Indian Reservation in Busby, Montana. The fallen had finally made it home.